Portable timer hangs around your neck on a 30" cord so you'll know when to remove the roast for dinner, cake for dessert! 60-minute neck timer has magnetic back to cling to fridge; 2 1/2"dia. Timer clock can keep you on schedule for appointments, too. As seniors, my husband and I use it as a reminder that something is cooking, the washing machine or dryer is done, outside watering needs to be changed or turned off, etc. The timer goes with me, even when I've no pockets that day! Getting busy, I tend to be away from timer on stove! Now no kettles, etc boil dry! When I am cooking and in another part of the house I have the timer with me to tell me when I need to return to the kitchen. Even use it for my laundry. Bought more for gifts. I already have several of these. I use them to time my cooking, my laundry, as a warning for getting out of the house on time, etc. Love them! This is a GREAT product! After I put something in the oven to bake, I am usually off to another part of the house to do something else and cannot always hear a timer in the kitchen. I also use this when I am working around the house or yard and have a hose on a plant for deep watering. No more 3-4 hour plant drownings because I got distracted. The cord is not too long, so it doesn't get in the way when I am working bent over. The loud ring is good for my hard-of-hearing husband too. And with it being around his neck, it is that much closer to his ears. Great timer, checked it against a digital clock and it was fine. Like that it is a magnet too but not a very strong one. To my horror I have reached that stage in life when if I put something in the oven and then leave the kitchen, I will probably forget about it. This new timer seems to work very well and is much more effective hanging around my neck than carrying a loose timer around with me. Well worth it. This is my second ordering of this item since the last ones broke. I ordered 3 so I would never be without one. I have bought this timer many times for friends. I have used it for years to remember food in oven or on stovetop. A teacher friend used it for timed assignments. She put it on the chalkboard (using the magnet) so she would not lose it! If you are an efficient person, you will love having a timer that you can wear while doing projects. Set the timer---when it rings you know to take clothes out of washer and switch to dryer and set again. A good friend of mine gave me my first kitchen on a timer rope. I have had this timer for 3 months, works perfectly every time. No more overcooked meals, what a great product. great timers good job.on delivery..
totally happy with the product and the price, good job !! I use this timer to get up from sitting too long. Its had a good long ring I cant ignore. Use more for my back than for cooking. Great item for great price. I purchased this timer for my mom who is 90 years young and still cooking every day for us. She has a hearing disability so she just sets this timer and hangs it around her neck and its gentle but audible alarm lets her know when things are done. When not in use it's magnet allows her to hang it on the side of the refrigerator. This timer is so, so convenient! I can now, do the laundry downstairs, go outside and rake or do yard work, and not forget something is in the oven!! My husband bought this for me, because I get busy with other things, and forget....he also bought one for our 85 y/o neighbor, who is a wonderful cook, and hard of hearing, and she loves it also! This holiday, I have bought one for my 3 daughters, and friends, who saw mine, and wanted one too.....in fact, as I'm writing this, I have mine on, and now nothing burns!!! thank you! Valerie Rouleau, CT.
Great to have for a forgetful mind. I use this every time I have things simmering or in the oven. Great reminder to myself that something is cooking. handy. this way i don't overcook the supper. I have bought several of these - I give them to my friends and family because they are so handy - you can be anywhere in the house and know that your cooking is done or needs to be watched. I hope to use this in the garden this Spring & Summer. Now, hopefully, I will remember to go inside and do a few things for my house, not my garden. I had a clip on one that kept falling off if I bent a certain way. This should be terrific. I purchased this timer because as well as being a cook I am a gardener. Lots of times I have something on the stove or baking in the oven and want to go outside during the time things are cooking. I used to have a clip on timer and it kept falling off. This way it is right around my neck and I will not be losing it. It has a nice ring. I also use it for taking naps as I don't want to take the time to reset my alarm. Great product! This timer has saved so many dishes from being burned! It is so nice to just put it around my neck and go do other things while I'm waiting for something to cook. I have given it as a gift to others and they love it too. I would give it MORE than 5 stars! THe price was Great,Being as old as I am My memory isn't that great. I can put this around my neck and I won't burn my food. Even though his is a kitchen product I do not think I have ever used it in the kitchen. When my daughter was younger we hung it on the wall near the time out chair and I used it there. Now that she is older and has to read 20 minutes a day for school it is great for that. I also use it when I want her to do a chore or play for a certain length of time. It is cheap enough so that if she loses it no big deal and she has actually never broken one. I use this most for when I am multi-tasking. I can start something...let it rest or cool and do something else with the timer set for the amount of time needed for the first 'project'. The timing is on time. I use this so I don't forget something on the stove. Kitchen Timer that is Nifty and you can wear. I Use this wearable kitchen timer so that I can continue with other chores around the house. It's s great item that you can wear and be assured that it will remind you were ever you are to check whatever you are cooking. Love it so much that this is my second one. Thank You for having! There are times when I am baking and I take my timer with me from room to room. Having it on a neck line will be handy so I don't say "now where did I leave my timer?" It will be right on front of me! I use this timer every time I am baking or cooking or just to be reminded of the time. I would buy this again. Loved this thing, but dropped it a few times, on my ceramic floor, it came apart and put back together a few times though and worked. Ordering another one. So surprised to see the reviews that they didnt last long...i hope i get another good one on this order. This timer works very well. It has a loud ring that I can hear in the next room, and the ring is just long enough to get me into the kitchen, but not so long as to be maddening. The unit is also magnetized, so I keep it attached to the side of the refrigerator. I've had it for almost two years now, it's been through a major move, and it's still working well. The only thing you have to remember when you use it is to be sure to turn the dial past the 55-minute mark before turning it back to the time you want, in order to start the timing. I HAVE FOUR OF THESE! I ALWAYS USE THESE WHEN I PUT WATER IN THE POOL AND WHEN I AM COOKING WITH GUESTS. DISTRACTIONS ARE NOT A PROBLEM ANYMORE. I have had this timer for years. This time I purchased it as a gift for a neighbor. Very happy with the product. I bought this timer to use when I plan to be in another part of the house and I need to time something in the kitchen. It works well and I am pleased with this purchase. so handy for forgetful people like me! Great! I use it when I go outside to sit on the deck, so I wont burn anything or forget to take my meds! This is the greatest timer ever because it goes everywhere you do. This frees me up to do things in other rooms so my time isn't wasted waiting around listening for the oven timer. My sister, the chef in a restaurant, took hers to work and now everyone in their kitchen wants one. best timer i have found! I work in an elementary kitchen, I have tried timers from everywhere! This one has been dropped, dunked and clanked against almost every surface possible. The only thing i can find remotely irritating is the magnet does become disconnected and the timer will fall. Other than that, it takes a licking and keeps on ticking!! TO KEEP TIME WHEN I AM WATERING THE GRASS.AS WELL AS MY WIFE TO HELP WITH HER COOKING. This timer is so handy. I use my timer to time my minutes of rest while exercising. I can put it around my neck, where it is very handy. Or I can use it for timing, while cooking when I am going to another room. It reminds me to turn off the pool. I have left the house in the past with the water running in the pool - not with this timer around my neck. I bought this timer to supplement the timer on my new stove, because the stove timer's alarm is too quiet to hear in the next room and too brief to catch my attention if I'm reading. This timer, by contrast, is loud enough to hear in the next room (it sounds like an old-fashioned telephone ringer) and lasts for about 3-5 seconds, long and loud enough to get my attention, even when I'm reading in the next room, but short enough so I don't have to jump up and run to turn off the sound. As a bonus, it has a magnet on the back, so I keep it attached to the refrigerator unless I really need to be in a room far from the kitchen, in which case I use the rope to wear the timer around my neck. Either way, it's perfect for what I need, and quite easy to use. You just have to remember to turn the dial past "55" before turning it back to the time you want. Great reminder when I'm cooking & step away. Had one in MA and it apparently did not make the move. This one appears to be the same very useful! As long as I wear it when I'm cooking I get to the food it time so it comes off before it burns. It's a real life saver! It helps me to remember when things are cooking on the stove so I don't become distracted. It is light weight enough to wear comfortably and it is accurate. It's my lifesaver! This timer has good quality. This timer is really neat! It beats the old timers that just stand up. I do not need to carry it with my hands. I do try to handle with good care because something like that is fragile, but it is well worth it. These timers are very convenient...you can take them anywhere you like and i like that. I use mine at home and at the camper. I take multiply medications at different times of the day & evening. Now I'm able to take my medications as prescribed. bought 2 xtra for friends. i replaced cord wtih used key circle & belt clip to wear on belt. I like the idea of having the timer around my neck when outside in the garden. My husband does not like the "tick, tick, tick", so does not use it. It is a good idea however. CAN MOVE AROUND THE HOUSE WITHOUT MISSING THE RING OF THE TIMER BECAUSE I HANG IT AROUND MY NECK. WHICH MEANS I CAN DO SEVERAL THINGS AT A TIME. If you tend to be forgetful when cooking or baking (when you put something on the stove or in the oven and then go on to do other things) this nifty little timer is perfect. It reminds you to check on things! THIS TIMER WORKS PERFECTLY FOR ME BECAUSE I AM PARTIALLY HARD OF HEARING. I NEED TO WEAR IT AROUND MY NECK SO I CAN HEAR THE TIMER WHEN I AM DOING LAUNDRY. I TIME THE WASH, SO WHEN IT IS TIME TO ADD THE WATER SOFTENER DON'T HAVE TO RUN OUT TO THE MACHINE CONSTANTLY AND BE CHECKING. I have bought several for gifts. The portability factor is what sold me. A timer is a timer until you find a timer that hangs around your neck and you can hear the ring wherever you are in the house. It doesn't last as long as other timers I have bought, though; wish they would lengthen its lifespan. Help keep track of time when the buzzer goes off and you can wear around your neck. Very handy for a hard of hearing and forgetful Grandma, however the ring could be louder and longer. Extremely Handy Around the House! Handy item to have; very useful and portable for on-the-go days. Ordered (2) of these. Would repurchase this item anytime! Perfect timer to take to any room. Easy to twist the dial - good for someone with mild arthritis or physical issues. Great tool for a multi-tasker like me - for example: oven timer is on for supper, while I am using this timer for a child's reading task. I use this timer around my neck when I am multitasking. The timer helps me remember a time sensitive task, while I perform another task. I've had this timer for years, and it's working great! My 4th purchase for gifts to my baker girlfriends. Love to use it when I am baking muffins in the mornings and trying to get ready for work. The minutes just fly by so having this timer on my neck lets me know when my muffins are done. Great product. This is a replacement for the same style of timer on a cord that had an unfortunate encounter with gravity. I prefer the new one - the cord is a better length and the bell rings slightly longer. Love this. If I am going out in the hallway of my complex, I have this timer with me. I will never loose track of time with this. I love to cook, but I must confess that I put things in the oven and get busy doing something else and forget to check my watch! Having a timer that I can hang around my neck so that it goes with me to do laundry, etc. is a godsend! Things in the kitchen are running much more smoothly! One of the handiest gadgets ever. I use for working outside or down at the barn while I bake in the oven, I can actually do two things at once! Great for farmers, gardeners, mothers Plus I don't have to set down the regular timer and forget it- its around my neck! I have to take medication a half hour before every meal. It is very easy to get distracted doing something in a half hour, but with this timer I is so easy to take my meds, set the timer, and not have to think about it. It is loud enough to hear when in another room so you really don't have to carry it around. I highly recommend this timer. I needed something my husband wouldn't loose, that would remind him to turn the sprinklers off. He's actually using it. The magnet on the back is a real plus, when he's done he puts it on the refrigerator. I am a busy, busy person and am always multi-tasking. Keeping my timer with me helps me keep on task as I scurry around. I depend on it every day and have purchased ones for my own family and friends. I bought this years ago. It times accurately, wipes clean, and even the cord still looks new. Along with a few other small kitchen items, it even makes a great dorm or house-warming gift. We now live in a townhouse with a centrally located and theoretically convenient kitchen, but I'm usually working downstairs or up on the third level and my aging knees now "hate" stairs. My cooking has become more casual (think crockpot and microwave), but timing still matters for some tasks. I can leave the timer around my beloved but often-preoccupied husband's neck while he's in his office, and know that he will go upstairs to drain the pasta for me. My whole-grain noodles won't end up turning from "al dente" to expensive mush just because I'm multi-tasking. I love that! This timer is more than for cooks. I use it for getting to the dryer before the "Permenant Press" items start to wrinkle. On jobs I don't like to do, I set the timer and must work until it rings. On things I love (needlework and Family History) I must stop when it rings. I love it, love it. I haven't burned a thing since I got it. Even if I fall asleep with it around my neck it will awaken me! I think every cook should have one! I have actually ordered more as gifts. I have looked for one like this for a long time. Saved many a burnt meal because of this little timer. I hate to stand by the stove, so this really helps me out. Thanks! Been wanting to get this for a long time. Extremely handy. Can use this anywhere you need a timer. Also great for TIMEOUT for grandkids. I carry it around when timing my cooking and baking. Small enough to go into a pocket, but if you don't have one, can be worn around the neck and it's light weight. One caution,the ring is softer than some timers so make sure to take it with you. I forgot to add that the magnet sticks well to most any surface. TIMER IS NOW AROUND MY NECK WHILE I ROAM THE PREMISES. IT IS DEPENDABLY TIMELY AND AUDIBLE. I've needed this for a long time...carrying my kitchen timer in my tight jeans pocket doesn't work! Hallelujah! In my busy life I've burned so many pots because I get distraacted while cooking. I have set timers but didn't hear them for one reason or another. I have put them in my pocket but on occasion bumped up against something and they were turned off. I hang this one around my neck and I can engage in as many activities as I need or be forgetful as I occasionally am and NO MORE BURNED POTS. "Lets me keep on doing other things"
the hanging rope could be a little longer so that it would fit in my pocket. when this one wears out I plan to by another. keeps me from burning my dinner. I would buy again and buy for gifts. Easy reading. Strong magnet. Light weight. Sturdy. Would like 2 hour timer for this size. I bought this for my youngest son, who often puts things in the oven and goes to his room where he can't hear it when it goes off!!! Never again with this wearable timer!!!! No more burned nachos!!! I use it when baking as oven timer is not loud enough to hear throughout the house. I also use it when using the clothes dryer for the same reason. It has many other uses for timing anything in the household. The price is right and it's accurate. However,it's too bulky hanging around the neck,could be smaller. I recently had surgery on my spine and I am restricted regarding the amount of time to sit or to stand. With this around my neck, I am reminded to follow the rules. The ticking is a bit annoying especially to others in the room. I wish it were not quite so loud. "This Timer is so useful!" It is a wonderful tool for the elderly that live alone,or confined in a small apartment, when they cook, or when the laundry is finished washing or drying. It serves as a reminder to call a friend who might not be feeling well. I know for I am one of the elderly. I wanted this to hang around my neck when working in and around my pond and gardens. I sunburn and tire easily so a 1-hour time is great for me. Cord is barely more than necklace length-will have to buy longer cord in nearest city with a fabric store as there's nothing here in my town. Still would recommend this as the timer works well. I have a poor memory. This timer keeps me from burning up the pies! Maybe, now, my family won't send me to "the home". It is useful, easy to read, helpful for all kinds of "rememberings." I just wish this timer was half its size so I could wear it out and around and on trips. Maybe I'd wear it on that trip to "the home." I liked this. I use it for a portable time-out timer for my 5 y/o grandchild. I used it once for cooking/baking so wouldn't get so engrossed in computer that I'd forget the food. So nice to be able to have the timer with you. I'm always on the go, so timing of things whether it's a cake in the oven or snatching a load of laundry before it wrinkles, it's a handy little gadget. A time-saver in it's self! My washer & dryer are in attached garage; now I start washer or dryer...set my timer which is nicely hanging around my neck...go back to my chores and know exactly when it's time for me to go back to laundry room to put clothes in dryer or fold those that are ready. No more trying to remember when I started the washer or dryer. What a timer saver for me!! Not perfect, but works well for cooks on the go. Love magnetic back and compact size. Often want to time cooking and can take out of kitchen to other parts of house to remind me, in case I forget when I need to check. Use gas oven often and really nice to be able set timer and go on with other things. This once-standard design has become nearly unobtainable. The choices available are too big to hold in the hand, egg-shaped (so that several of the times are blocked from view), or designed for only a few minutes, not an hour. The pointer should have a black line down the center, to make it easier to line up the pointer with the minutes on the rim. The white groove it has is hard to see. Handy for keeping track of various projects needing timed, i.e. watering, baking, etc. Like the magnet. Would be nice to be able to set it up - have a flat bottom or little legs to stand on. Rope for around neck is great though a little long for my short statue, but easy to deal with. Great product. Hope it lasts as long as my last one. multiple uses: timing therapy exercises,reminder for meals, bedtimes, appointments; all without searching throughout the house to find a timer for each activity. Lanyard makes this timer a gem. I like it a lot!! Very easy to use!! This timer helps us in so many ways. We keep one timer in the RV 5th wheel and one at the cabin where we have chores that need us to be reminded. The magnet had to be glued to the back of the timer because it kept falling off. Liked being able to find it in the first place as it's hard to find one like that. It's very practical for me when I leave the kitchen area. Just wish it was a little bit louder for me. Really appreciate that it has magnetic back so it's always easy to find. This handy little timer is right within hearing range as it goes wherever you go. You hang it around your neck and it dings when the time is up. Easy to set..no more mistiming. I recommend but one less star due to cord not being strong enough. Not to forget when cooking something. When I have something in the oven or stove and need to go outside to work in the yard, I hang it around my neck and I don't burn my cooking! Used as a time reminder during practice with kids in the 4-H Shooting Sports Program. Never forget what is in the oven or on top of the stove! 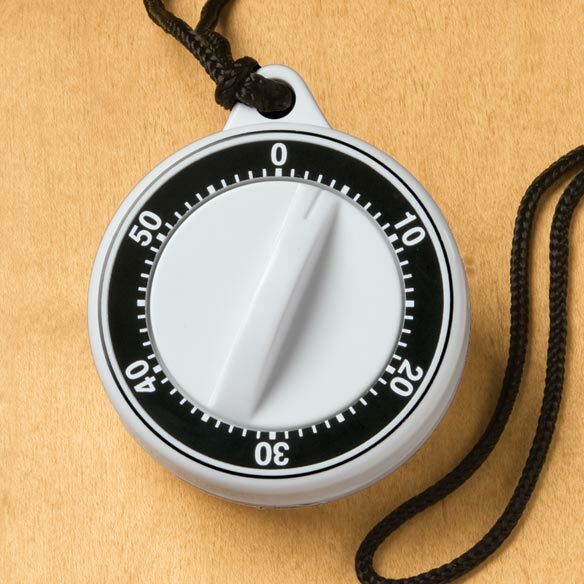 A casual cook will walk away from a stove to do something else... answer a phone or check a computer... with this timer around your neck, you will be reminded when your baking is done. Essential for casual, distracted cooks or simply a high school son heating water for hot chocolate. The pot is not forgotten on the stove. The baked items is not forgotten in the oven. Unless you carefully read the timer instructions, the bell will not go off. I sent this product back because the sound was not loud. I was going to use it to go alone with my timer on my microwave but neither one were loud enough. I bought the timer because my washer and dryer are in the garage of my house. I like to take clothes out of the dryer just as they dry. To do this I needed a timer so I would be out there when the dryer went off. This particular timer was so convenient to use and hang around my neck. I could go ahead with with my other projects without fear of missing the dryer when it was finished. I had a problem with the first one, in that it ceased working 3 months after I got it. I am buying one more so I can make sure that the last one wasn't just a faulty batch. I like the white color. It is difficult to turn to set the timer and the ringer is not as strong as others I have had. It is a little too quiet to alert you that time is up. Liked the convenient string for your neck. Keeps it close by as a reminder. The ringer keeps going for a little longer than I would have expected, but there is no chance you would miss it. Can walk away from the kitchen without fearing you missed the timer. The timer continues to tick after the bell goes off. I had been looking for a timer that I could carry around with me without having to hold in my hand. I thought "ah-ha" when I found this timer with a rope and magnet. That way, if I had to go do something else while my meal was cooking, I could just hang it around my neck. When I received this timer, I tried it out & found that it works well, but it in my opinion it's just a little too heavy. It could be just me, but it feels weighty around my neck. I've had 5 or 6 of these now. They don't last that long before the timer just stops running!!! BUT: I like the ease of putting one in my pocket when cooking or doing other timed chores. For the price, this timer is okay, but it's not very loud. This timer is too big and too heavy. The weight is not comfortable hanging around your neck. The clock does keep correct time. The bell broke the first day I used it. I still use it but I have to listen for the ticker to quit. Very cheap in look and quality. I'd send it back, but it's not worth the cost of shipping. Great idea - very poor and cheap product. I'm absent minded and forget about things I'm cooking or things in the dryer that need to come out right away when dry. I liked the idea of a timer to hang around my neck and go with me around the house to remind me of things I am timing. The timer dings whenever it moves and it is heavy and very bulky around your neck. After receiving this I realized how much I now appreciate digital timers for accuracy. The dial also is hard to turn. One nice thing is the strong magnet on the back so you can hang up the timer on the refrigerator. If someone would take a digital timer that is small and light-weight and put it on a rope, I would buy it in a minute. That would be a helpful item. I returned this item. Very cheap item. Hard to set time. Bell is so low, I couldn't hear it in the same room I was in. If I set it for less than 20 minutes, it never rings. If I set it for more than that it works properly. Timer is a great idea, but the first one didn't last more than a couple of weeks when it just stopped ticking. We called customer service which was great and they replaced it promptly :) The next one barely lasted 2 days before it too stopped ticking. It looks nice and should work, but it's not very durable. I bought two of these; one for my mom and one for me. I thought it would be great for my mom since she often leaves the kitchen after putting something in the oven, only to forget about it until it's burning. I thought if she carried the timer around her neck, she would remember. We used our timers one or two times before they quit working. At best this is a dollar store type product. Way overpriced egg timer. Sending back even at the cost of shipping to myself. It have been no possible get a Timer that works. You can not hear it ding. It was to be used by my mother to open garage door for Meals on Wheels. It is of no use because you can not hear it. There may be a teeny little sound but you would have to have it at your ear! Not useful at all. This item did not work correctly. If I would like to time a three-minute egg, I'd go to 60 then back it up to 3 minutes-- and NOTHING! Tried to time 10 minutes and the ticking just stopped a minute or so into the timing. my neighbor could use this because see can bring it into the living room while she's watching tv. Than see can hear the timer go off. Sometimes if she uses the kitchen timer she can't hear it from the living room. This will help me a great deal as I am concerned about forgetting things on the stove - short-term memory loss. I have an Autistic son and having a timer we can take with us will be very helpful. My Daughter needs a timer. My Sister need the eye drop guide. It's easy to carry on me. uses this constantly, easy to remember than writing notes. Necessary to keep me from starting a fire in the kitchen. This is great second one never over do keeps track of every thing! Laundry Cooking Anything you need a memory poke! Convenience and portability. Easy for my mother to use and not forget something is in the oven. timer.Now I will have the timer around my neck. I have a built in stove with a timer that does not work. I do have a timer but I am busy moving around the house all day carrying things and I found this item could be very helpful around my neck or a stationary place. Very handy if you are outside or in another room. Works great. Can be in another room and know when it goes off. Will be better for me, never knowing if I will be outside or what. Great idea if you ask me. To stay on schedule with work and other activities. I work at home, and often lose track of time. My last time has stopped working and was waiting for free shipping offer. I needed a reliable 1hr timer for cooking. I will be able to know when to return to kitchen. I forget so, this is with me at the time I need to time something. Forget a pot? Never again. Great product for remember kitchen pots and oven items. Need this on cruises when you go into steam room or sauna. They never have any clocks or timers that work in this area. This will be perfect. I'm hoping this will wake me up when I nap so I won't sleep too long.